Pins & Petals - Pins & Petals Recipes that are family-friendly and not difficult to make but very delicious! The abundance of dyed hard-boiled eggs around here is really quite ridiculous. We dyed Easter eggs on three separate occasions multiplied by three kids and I'm certain we have well exceeded 4 dozen hard-boiled eggs now! We are a hard-boiled egg loving family but there is no way we can eat that many before they go bad. Since I hate wasting food I wanted to come up with a new delicious way to eat them so I came up with this recipe just last week. The title was already long enough so I didn't want to overwhelm anyone and add that this is also gluten free! But it is gluten free and I think that's super exciting for so many people who re struggling to find delicious recipes that meet their dietary restrictions. Oranges just do not get the credit that they deserve. We all know that they're the Vitamin C champions and I'm sure many of us grew up drinking a glass of orange juice the moment that we felt the onset of a cold. Not only do they pack a lot of great vitamins and nutrients but their wonderfully clean citrus scent can freshen a room in a heartbeat and just so happens to be one of my favorite smells! This delicious citrus fruit is great paired with so many flavors and can be both sweet and savory. I mean, clearly this fruit deserve more credit that it typically receives, right? I don't know about you all, but my Holidays started in July. Lakeside. With cocktails. And I have basically been battling the healthy eating, weight maintenance, keeping-in-good-shape since then. 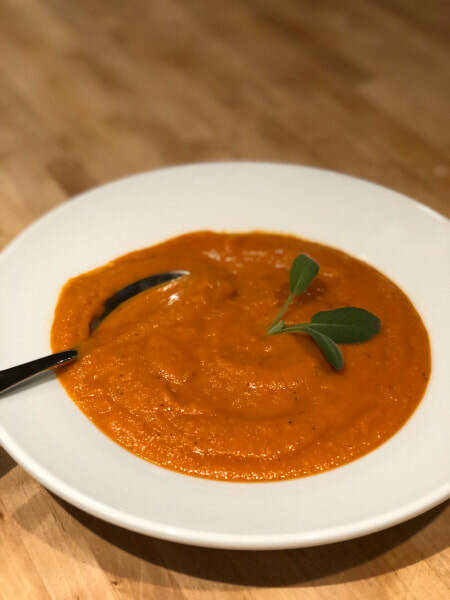 It's been a long Holiday season...In my efforts to lose the Holiday weight I have decided that healthy soups are going to be a prominent feature in my day-to-day life in addition to eating healthy, working out daily, and sticking to my Arbonne healthy-eating cleanse. Here's hoping it works out! I've previously posted about my love for my Shaved Brussel Sprout Salad and this one is a little similar in the base and the minimal dressing that I use. I am one of those weird people who prefers very light dressing - if you can even call my go-to a dressing... This salad is great because I use 3 salad bases interchangeably depending on which one I have readily available or which one sounds good at the time I am grocery shopping. I use Lacinato Kale, Swiss Chard (any variety), or shaved Brussels Sprouts. What I love about all 3 of these superfoods is how rich and flavorful they are and also their great hearty texture which really makes it feel so filling. It also stands up to just about everything you pair with it, which I love. Much like other larger families, we primarily shop at Costco for the majority of our weekly bulk groceries because with three growing kids, they can eat a lot! And, like a lot of people when shopping at Costco, our eyes are much bigger than our actual stomachs! At one of our weekly Costco trips a few weeks ago I saw a big bag of delicious Coconut & Cashew Butter granola and had to have it! Weeks later and I ate maybe 1/2 cup of the 42 cup bag. I guess I thought I would eat it far more than I really did… Granola is tricky like that! It seems like a healthy choice; I swear I will snack on that instead of Cheeze - it’s but in reality – I don’t. I am not a cereal eater so it wouldn’t serve as a replacement for that in the mornings and I don’t eat yogurt so using it as a healthy crunchy topping didn’t happen, either. Enter – COOKIES. I do love cookies. I especially love oatmeal cookies. So with the left-over bag of granola I figured granola is made out of oats, oatmeal cookies are made out of oats, and that seemed to make sense as a delicious cookie option. They turned out really yummy and had a subtle coconut taste to them. They were soft, though not chewy like a standard oatmeal cookie. 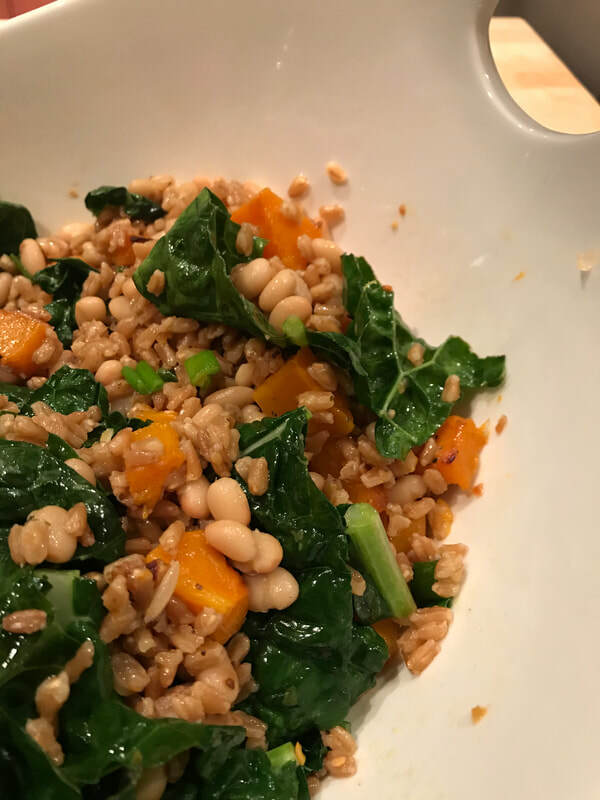 A light but very hardy vegetarian recipe perfect for an Autumn or Winter dinner.It is much quicker and easier to purchase the butternut squash already peeled and cubed in the package – you can usually find this at your local supermarket. If you cannot find this and use a whole butternut squash, it is safest to cut it into 1/4’s and then peel it and cube it. I love salads. And I love vegetables. So naturally, this salad is perfect for me! What’s so great about it (besides everything!) is that if you tend to eat a lot of salads this is a great option for something a bit unconventional to break up the monotony of lettuce or spinach salads. Another great thing about this salad is that you can really change it up to suit your taste buds or dietary needs/restrictions. You treat the shaved brussel sprouts like any other salad base so you can add just about anything to it and it tastes great! And, obviously it is a very healthy base, too! Summer brings the best of things; sun, outdoors, trips to Lake Tahoe, and light healthy dishes. 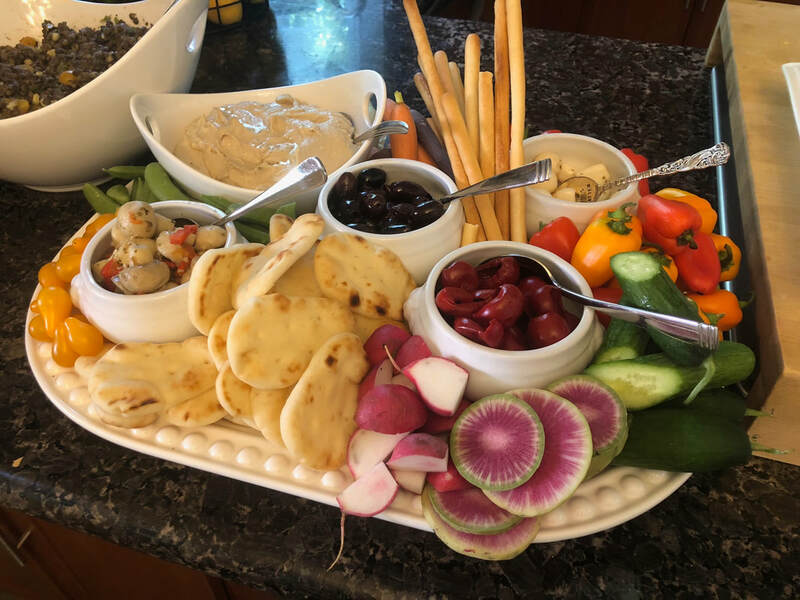 I especially love summer dishes that require minimal cooking – or can be barbecued – and can be served at room temperature. 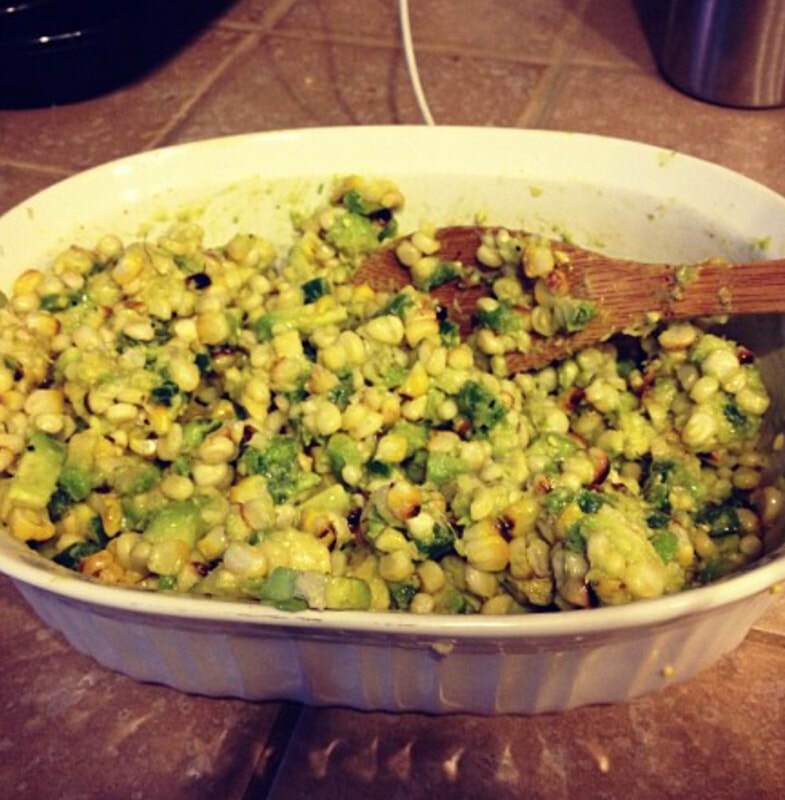 ​My favorite summer dish is a Corn, Jalapeno, and Avocado salad with lime and extra virgin olive oil. This combination is to-die-for! 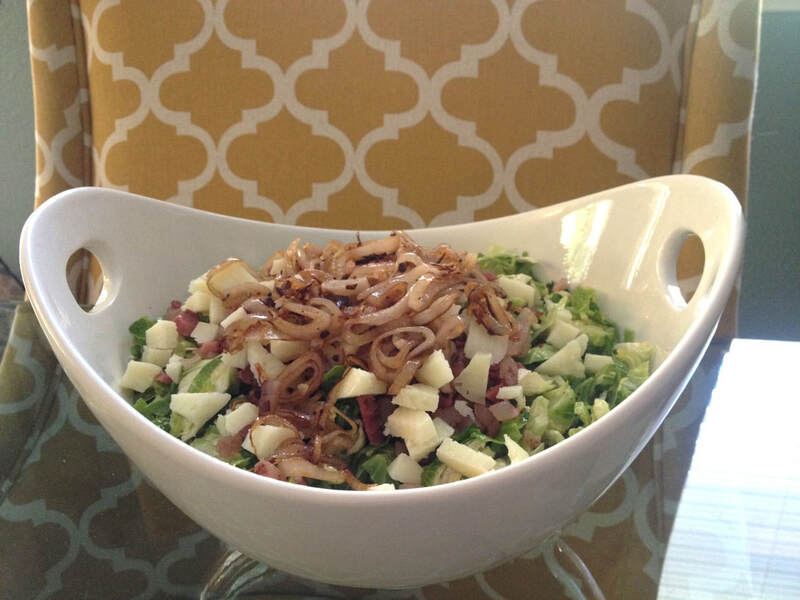 There are many variations of this salad that can be made depending on what sounds good and what you have on hand, but, I always use this recipe as the base.